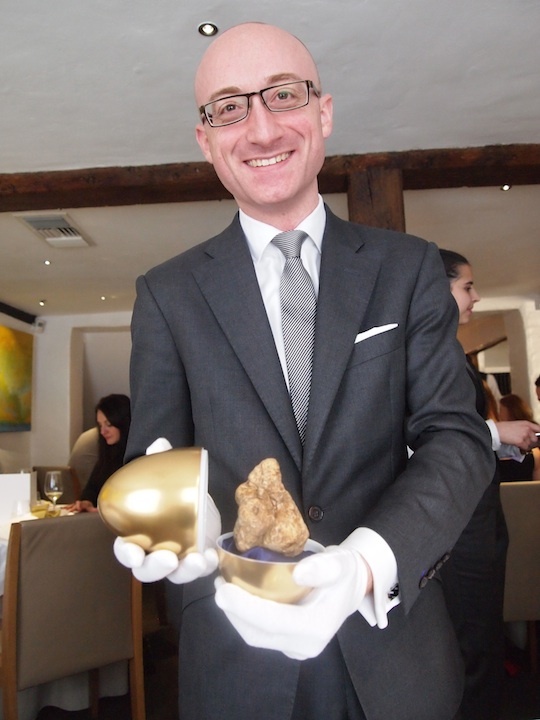 At The Fat Duck, operation "Christmas Lunch 2013" was a very serious and passionate affair. The Fat Duck is of course world famous for its carefully designed, elaborate and entertaining, 12-course tasting menu, and they wanted the Christmas lunch menu 2013 to be at least its equal and perhaps even to surpass it. Hence, preparations for this year's Christmas lunch started in February already and the creative team responsible for creating the Christmas menu, has worked closely with experts like Polly Russell, curator of Food Studies and Anthropology at The British Library and Bernard Lahousse, food pairing expert and researcher at Foodpairing.com. 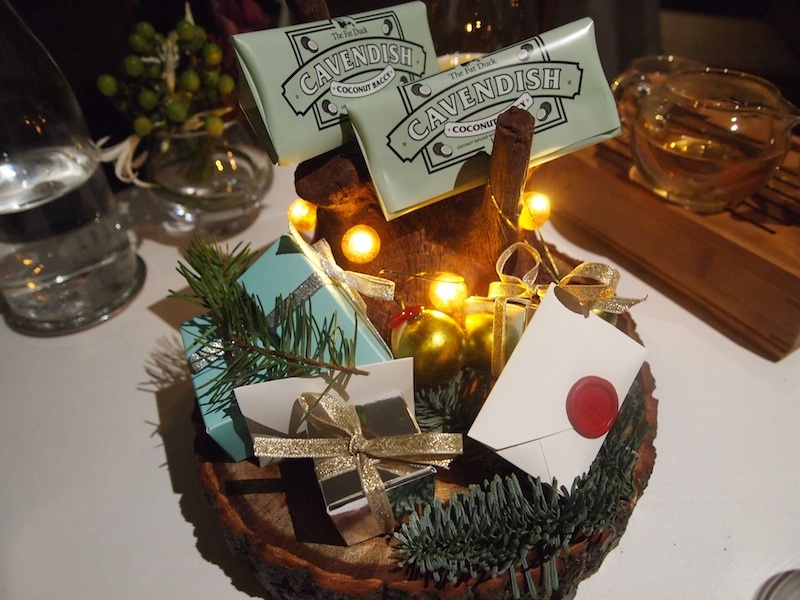 All their hard work has resulted in a unique 12-course Christmas menu that features brand-new dishes based on historical festive dishes and new versions of classic Fat Duck dishes with a festive twist. 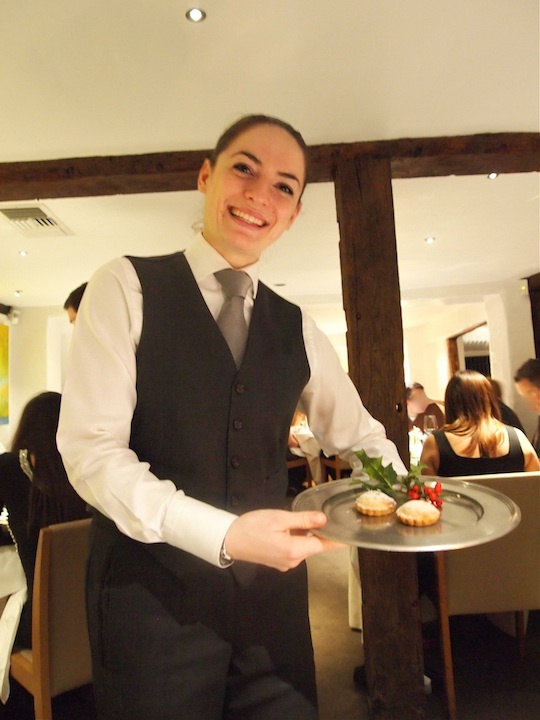 Like last year, the Christmas lunch menu is served exclusively on three Sundays in December. This year, the chosen dates were December 1st, 8th and 15th. As you can imagine this special performance comes at a price. I had booked two tickets for Sunday, December 8th and we paid £350 per person, excluding service charge and drinks. Even this hefty price tag however, cannot begin to cover the costs incurred. To start there was this year's version of the Fat Duck's signature palate cleanser: nitro poached Buck's Fizz. First a dollop of a light champagne and orange mousse is put on a spoon. 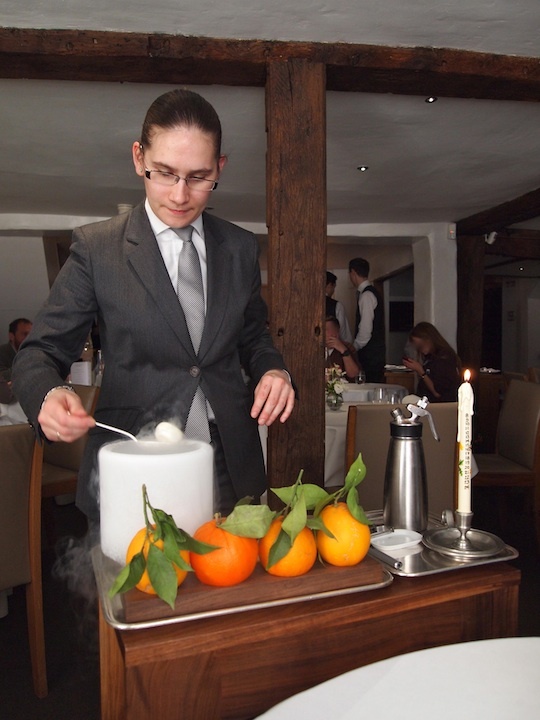 The mixture is then poached tableside in liquid nitrogen (-196 °C), which transforms it almost instantly into a frozen, meringue-shaped Buck's Fizz. The Buck's Fizz is served with a 'squeeze' of orange zest and must be eaten immediately or else you miss out on the full (flavour) sensation, including the puff of smoke that comes out of your nose when you eat it. I never get tired of this aperitif and I loved the orange flavours, both the elegant flavours in the Buck's Fizz mixture as the more zingy ones from the zest. 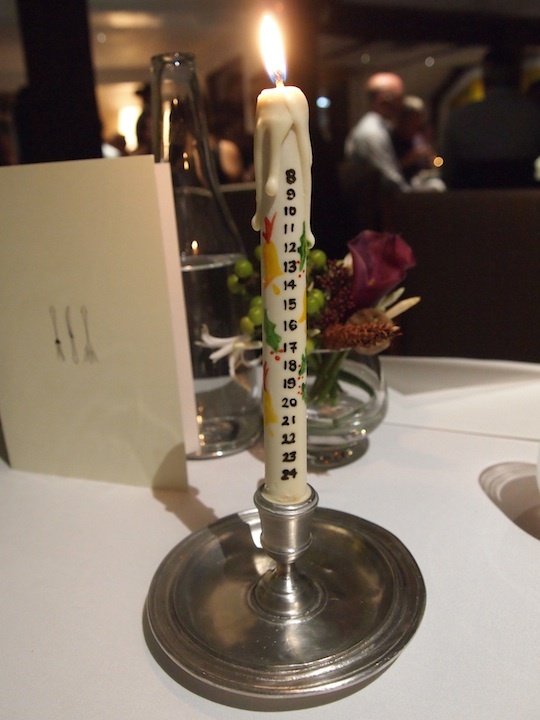 Do notice the advent candle in the photograph - it will return with the eleventh course. Must revel, as Queene, in the court here. The crackers, once pulled, revealed a copy of the first verse of the Twelfe Night Poem, a golden paper crown and three delicious beetroot jelly beans. Shortly after two dishes arrived, 'Queen of the Pea' for me and 'King of the Bean' for my husband. 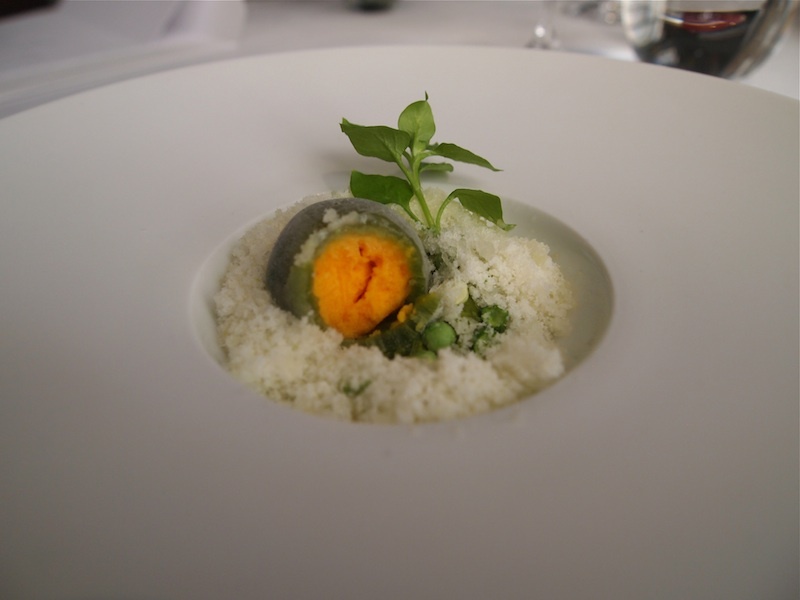 My dish was comprised of a beautifully made frozen 'pea', green on the outside and bright orange on the inside, placed on a bed of wasabi snow. 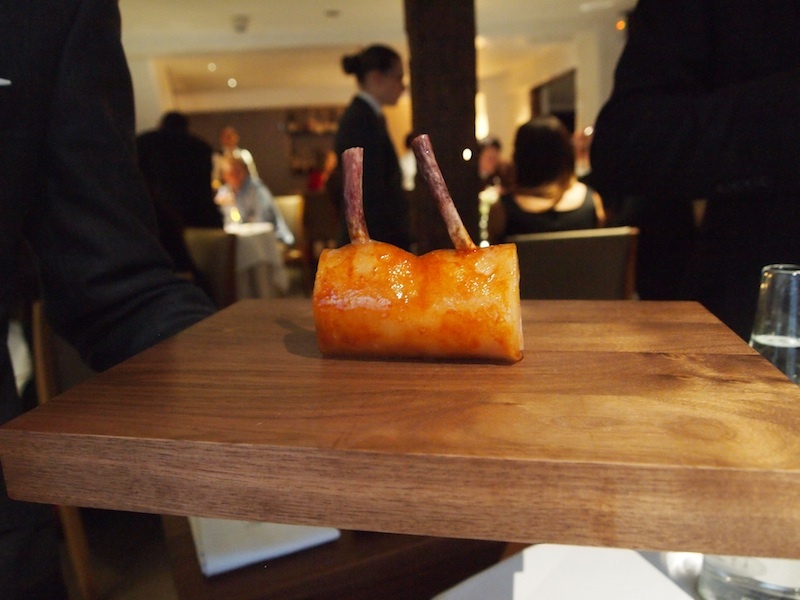 But nothing is what it seems at The Fat Duck. The 'pea' was in fact a beetroot sorbet, made from golden beetroot juice, vodka and vinegar, coated with a thin gel layer of pea juice and vodka vinegar. Hidden underneath the snow were some iced 'peas' and a lovage emulsion and the dish was garnished with a sprig of chickweed.The freeze dried peas were bursting with pea flavour and the lovage puree was wonderfully concentrated and pungent. A terrific dish with distinct but elegant sweet flavours, balanced out beautifully by the freshness and sharpness of the wasabi snow. 'King of the Bean' had similar flavours and textures, however the pea had been replaced with a purple 'bean' and only red beetroot was used. This was followed by the third course, a dish called 'Eat Me Date'. 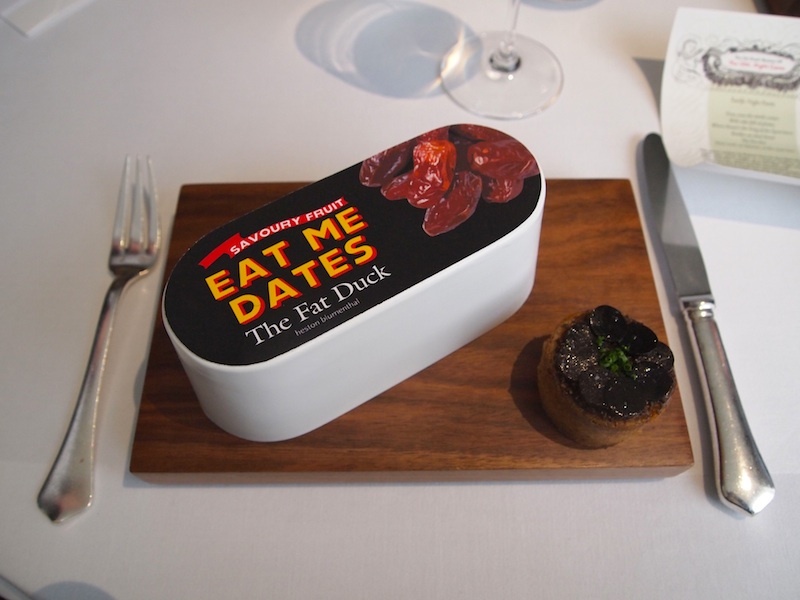 Underneath the (custom made) 'Eat Me Date' Fat Duck cloches was a thin layer of hazelnut sour cream that had a delicate, light touch of lemon and was covered with a mixture of finely chopped chives, toasted hazelnuts, black truffle and pain d'épices crumbs. Perched on top was a meat fruit. Meat fruit is an historical dish that dates back to fifteenth century. 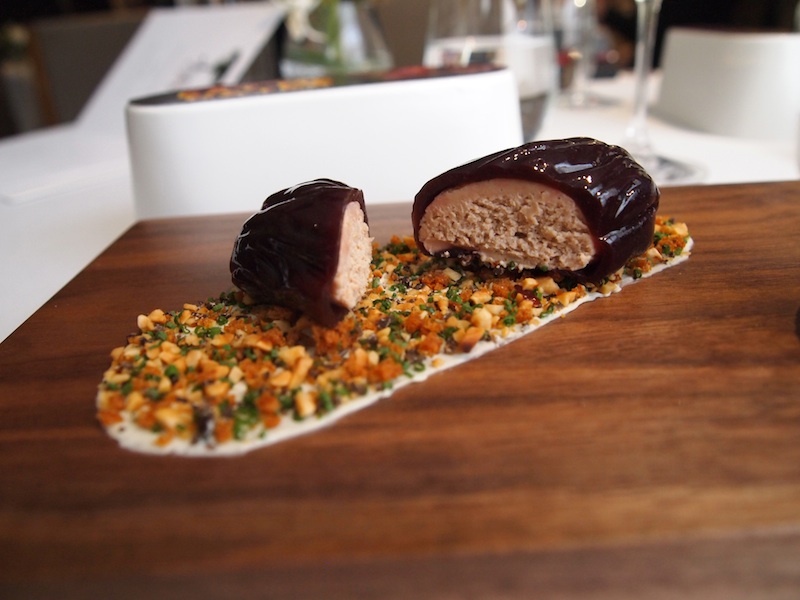 Basically it is meat disguised as fruit and it is one of the most iconic dishes on the menu at Heston Blumenthal's London restaurant Dinner. 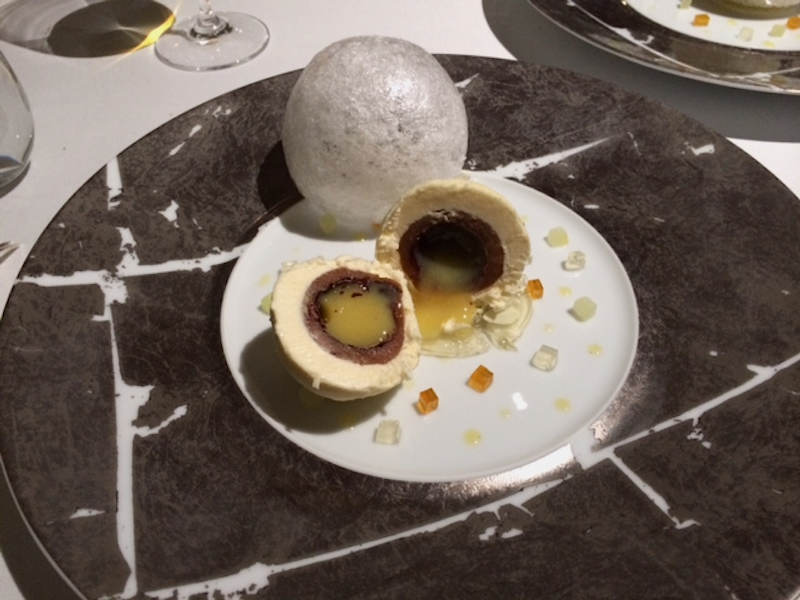 The one served at Dinner is shaped into a mandarin and has a foie gras and chicken liver parfait filling and the skin of the mandarin is a mandarin jelly. This particular meat fruit had a chicken liver parfait filling and the skin of the date was a thin layer of fig jelly that was shaped to look like a date. The combination of flavours and textures was absolutely sensational. Creamy, rich and smooth chicken liver parfait combined beautifully with the elegant fig jelly that had just the right amount of sweetness and acidity. The addition of the sour cream and the chives, truffles, hazelnuts and pain d'épices worked really well. A wonderfully balanced dish, it's got unctuousness, it's got crunch, it's got freshness and there is a kiss of spicy warmth from the pain d'épices. From an historical perspective it is perhaps worth noting that the combination of figs and liver goes back to Egyptian times in a slightly unexpected way; the Egyptians (force) fed their geese figs. But there was more. 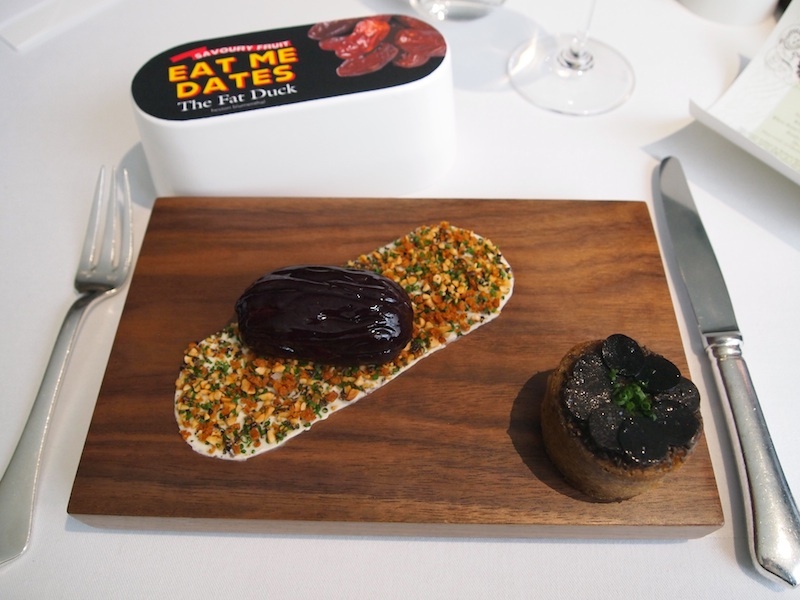 Next to the Eat Me Dates box was a divine buckwheat crumpet, topped with truffle butter, chopped black truffle, identically cut slices of black truffle and finely chopped chives. The buckwheat crumpet was wonderfully moist and the nutty flavours of the buckwheat and the truffle complemented the meat fruit very nicely. Next up (fourth course), Plum Porridge, a savoury-sweet meat and plum porridge. Historically, this is a dish that was traditionally served at Christmas. Early versions of plum porridge date back as far as the 1500s. 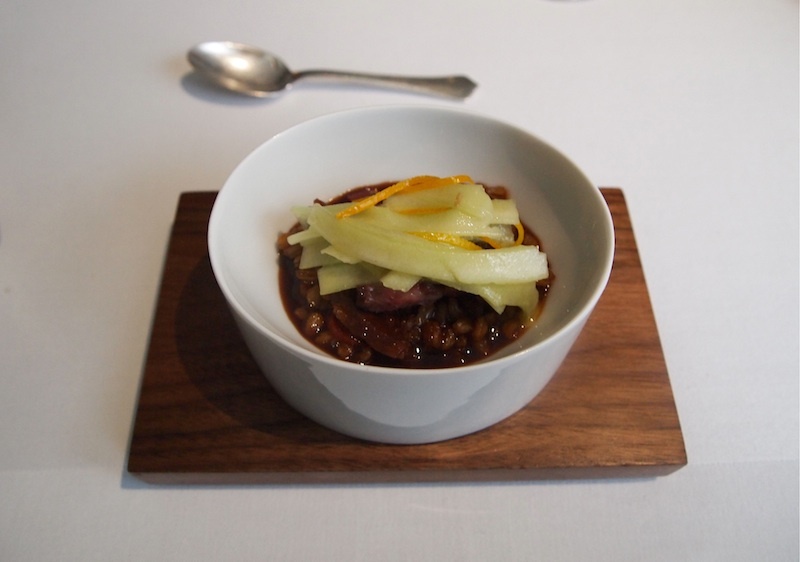 This version contained emmer wheat, an ancient grain variety also known as farro, slow-cooked ox tongue, calf's tail, Wagyu shortrib and umeboshi plums, served in a rich sweet and meaty sauce, elegantly flavoured with orange. All cuts of meat were perfectly cooked; loved the different textures and flavours. The sauce, based on a reduced chicken stock, beef stock and barberry gel, had wonderful fruity notes. To counterbalance the rich porridge, there was some some pickled celery and thin strips of pickled orange zest. An extraordinary combination of comforting flavours with a perfect balance between sweetness, sharpness and richness. The use of orange was well-judged and it really lifted the dish. Great textures too, however I would perhaps have liked the celery just a bit thinner. Scallops in almond milk followed. Superb, tender and succulent scallops, cooked a la plancha and glazed with kombu, served with a silky almond milk foam and complemented by a drizzle of chocolate oil and freshly shaved white truffle. The glaze had given a fabulous caramelisation to the scallops. Underneath the scallops was a scallop tartare, mixed with small cubes of cocoa jelly, crunchy pickled kohlrabi, pickled buddha's hand and a fluid roasted almond gel. The almond milk enhanced the sweetness of the scallops and the syrupy chocolate oil had wonderful coffee-caramel flavours and a lovely nutty finish. A sublime dish with a great flavour contrasts and a beautiful balance between sweet and bitter flavours, the chocolate oil bringing everything together. The sixth course was Gold, Frankincense and Myrrh. This dish also featured on the 2012 Christmas menu, but the 2013 version was less elaborate, although just as meticulously constructed. As the name suggests, this dish has three components. 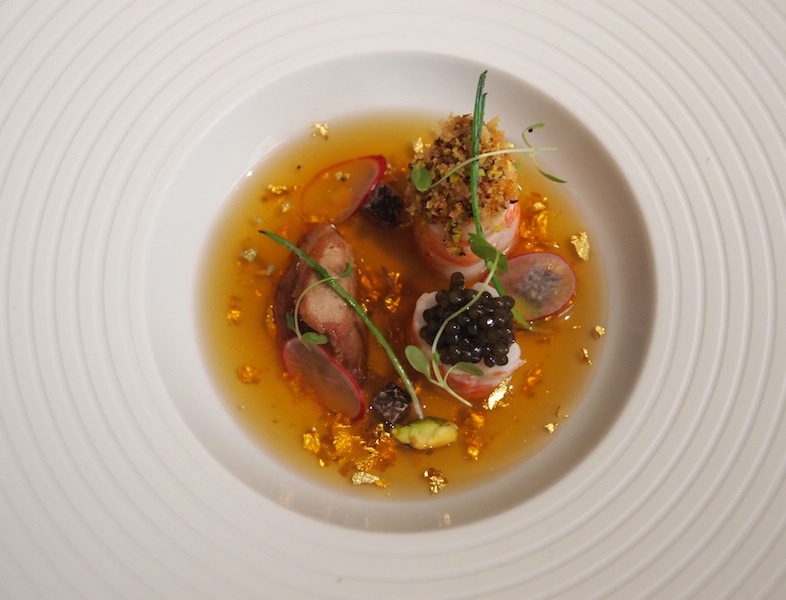 The main element is a plate with langoustine, one piece topped with Russian Imperial caviar and one with a crunchy mixture of finely chopped soy-glazed pistachios, panko bread crumbs (fried in lardo di colonnata) and some freeze dried coffee, a small piece of lamb sweetbread (brined, then cooked sous-vide), accompanied by small cubes of black truffle, thinly sliced radishes and pistachios. At the same time a small, transparent teapot with hot water is placed on the table. Then you are presented with a black box (made from myrrh). 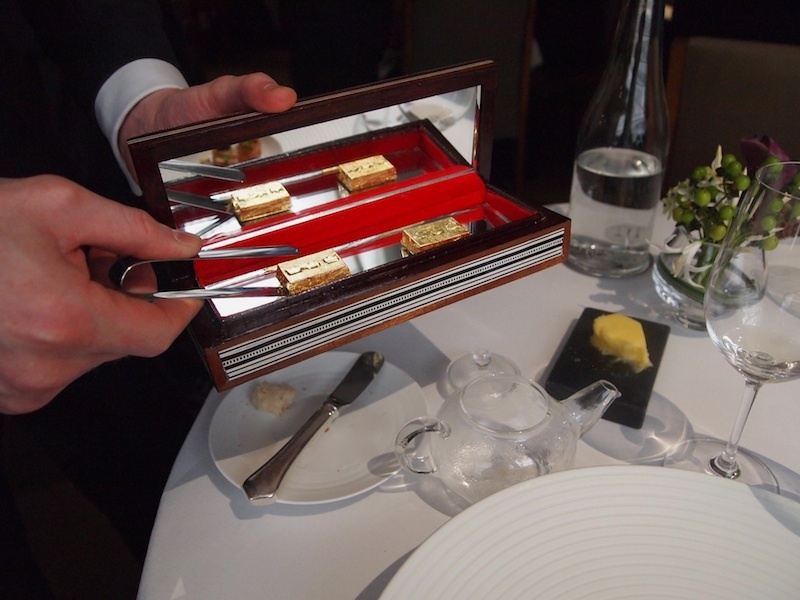 Inside the box are two langoustine bouillon bars, wrapped in gold leaf. Once placed in the teapot, the bouillon bar instantly transforms the hot water into a perfectly clear and fragrant bouillon, which is then poured around the langoustine and lamb. 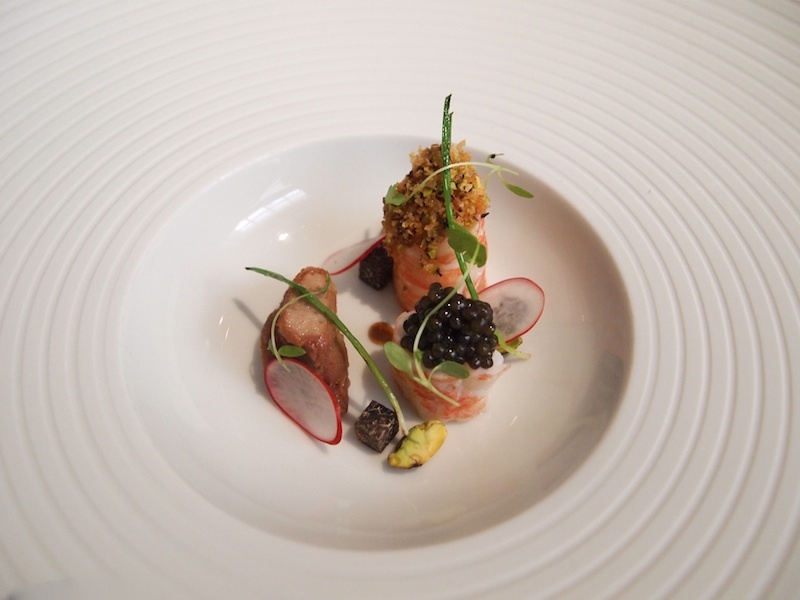 The final result is a simply stunning dish with exquisite flavours. 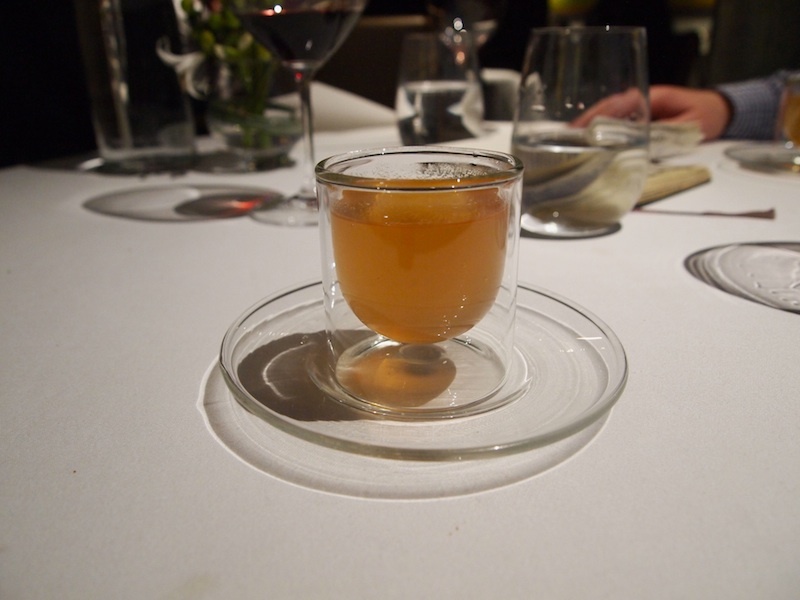 Best of all was the incredible langoustine stock, mildly infused with frankincense, rich in umami and with the perfect hint of saffron, that delivered a lovely warm finish. Elegant put powerful at the same time. Next course was Sole Victoria. 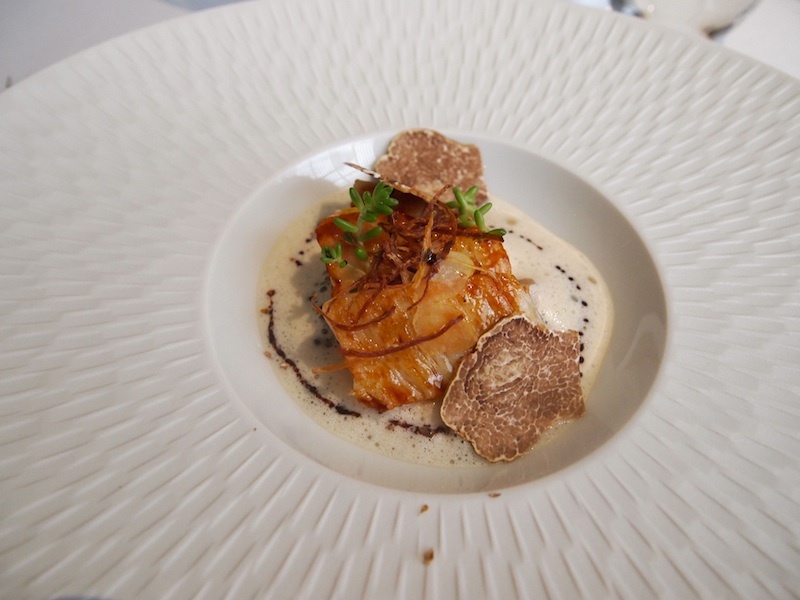 A succulent fillet of sole, superbly cooked sous-vide, covered with a thin layer of scallop mousseline, an impressively made truffle 'skin' and served with a dark and intense truffled sauce. 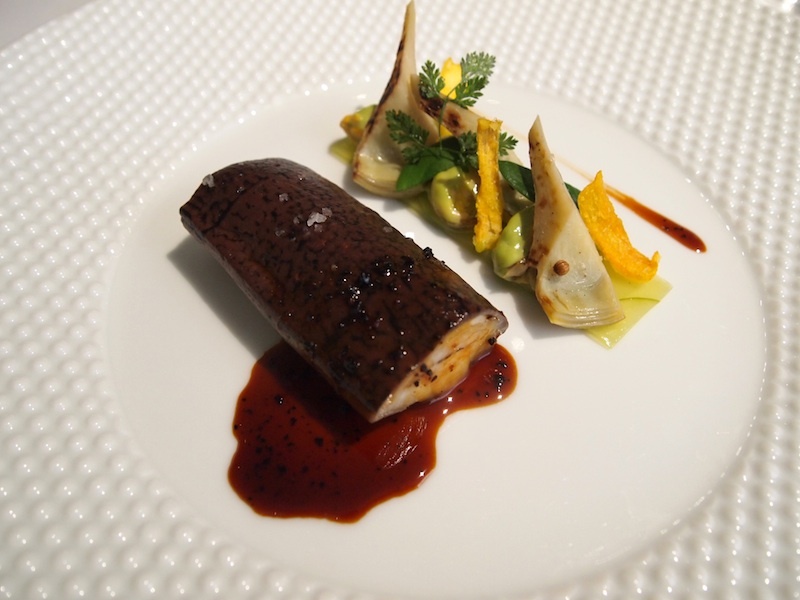 The skin was made from fish stock and truffle juice, and to get the 'skin' effect the restaurant uses a food ink printer cartridge and a transfer sheet. Also on the plate were thinly sliced crisp apples, coated in a cider gel, artichokes, onion crips, oyster leaf and small juicy mussels, covered in mint and mussel sabayon. A visually striking and carefully constructed dish with balanced flavours, the crisp apple slices brought a lovely freshness and the mussels added an extra flavour dimension. On to the eighth course: Pig in Blanket. Rack of pork (13 week old Gloucester Old Spot, cooked sous-vide , then quickly fried and glazed with a reduced pork sauce), wrapped in a nice and thick layer of lardo di colonnata (the blanket! ), accompanied by a smoked coconut emulsion, some crunchy Brussels sprout leaves, grilled cauliflower, shaved white truffle and a pork jus reduction perfumed with jasmin and juniper. Where to start? Firstly, pork and coconut proved an unexpected, but killer flavour combination. Combining pork and coconut is not uncommon in Asian dishes, curries in particular, but never have I seen it done so elegantly and with such finesse. The milky, sweet coconut really enhanced the sweetness of the pork and with the smoking the coconut flavour had gained more body and a wonderful meatiness, which resulted in a dazzling flavour sensation. 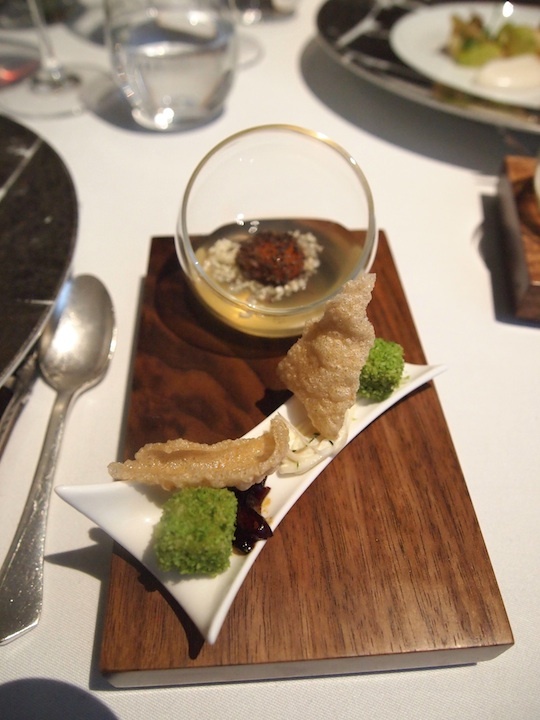 To balance these powerful and exhilarating flavours, a light bacon dashi with a soft quail's egg, sprinkled with pork crackling, was served on the side. On the same board was a small tray with cubes of ham, covered in a mixture of sharp mustard and finely chopped parsley, rice crackers and pickled kohlrabi. 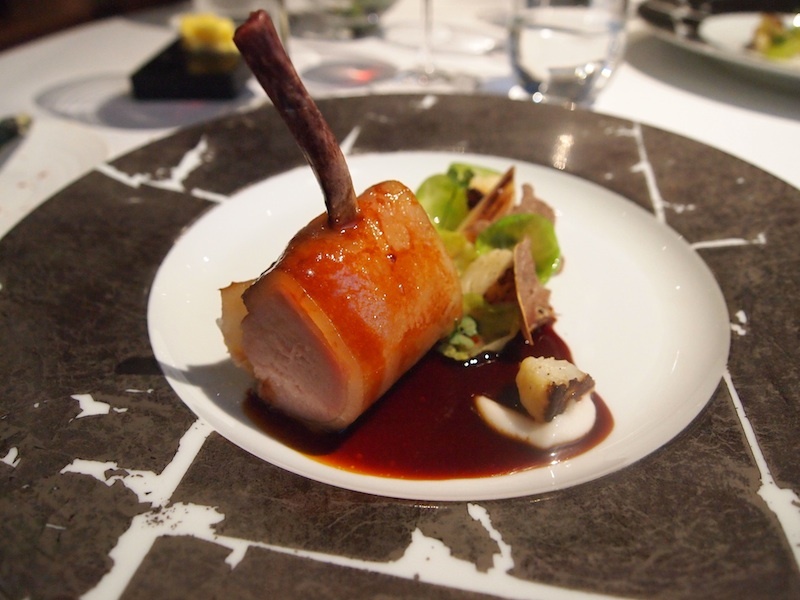 An outstanding dish that displays exceptional creativity and skill. 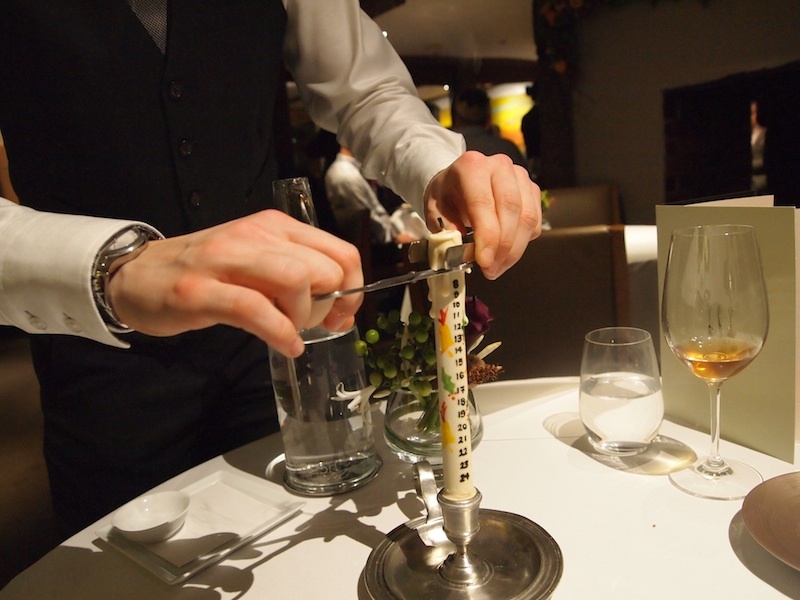 The Fat Duck truly understands the art of food pairing. Ninth course: Hot and Iced Potus Ypocras (Medieval mulled white wine). 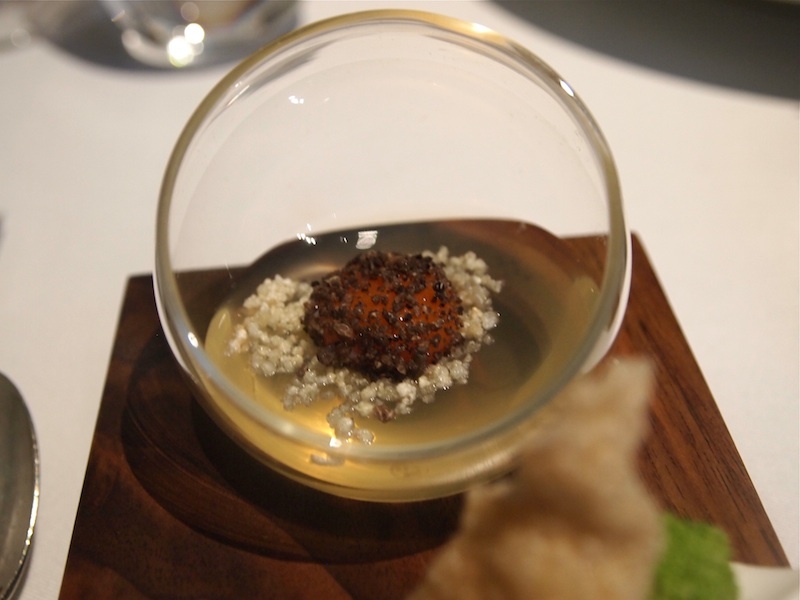 The original version of this Fat Duck dish, called 'Hot and Iced Tea' was created in 2005. This aromatic Christmas version is based on Gewürztraminer. In the glass there are two fluid gels with different temperatures, the hot one being 70°C, so you experience an alternating hot and cold sensation. Lovely warm flavours from the spices, like cinnamon, cloves, nutmeg, mace and galangal. Shortly after a quite spectacular snowball was served. This dish is based on the classic festive snowball cocktail. The brittle and elegantly sweet white casing was made from sugar and kabosu juice (a green citrus fruit). Underneath this white dome was a second snowball, comprised of a layer of milk parfait, sprayed with white chocolate, followed by a layer of apple compote, cranberry pate de fruit, pistachios and dried cranberries and finally a crispy dark chocolate sphere with a wonderful snowball cocktail centre. 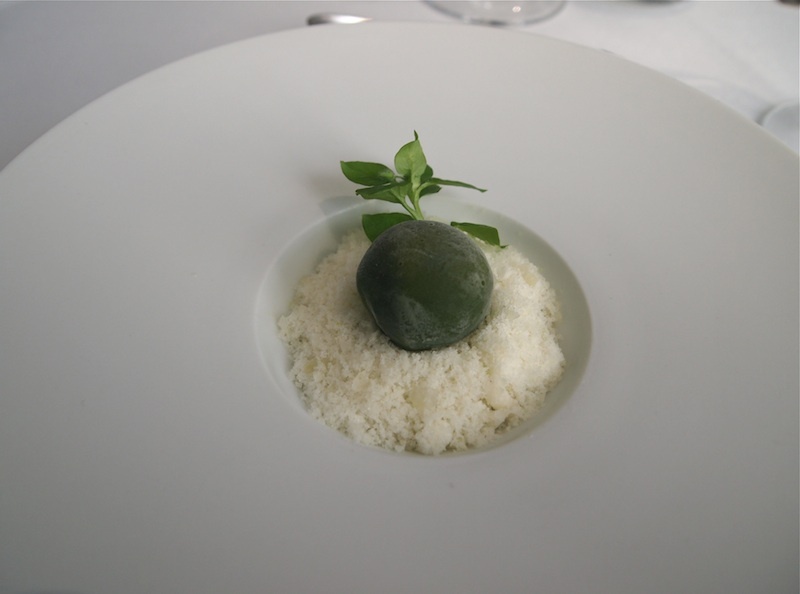 The snowball was placed on a kabosu jelly disc and dotted around the snowball were cubes of elderflower jelly, compressed Granny Smith apple and kabosu jelly. 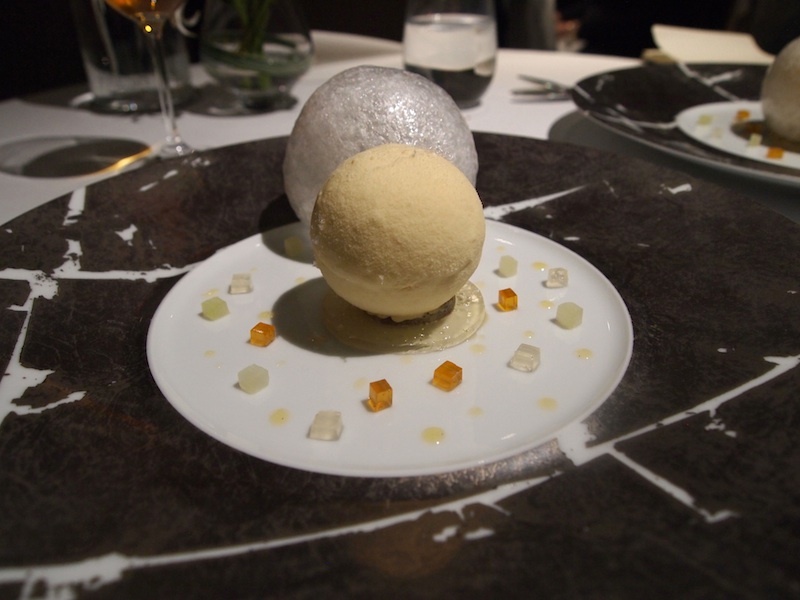 A wonderfully festive and precisely executed dessert with a great variety of flavours and textures and a perfect balance between sugar, bitterness and sourness. The next (eleventh) course is called Advent. First the (edible) advent candle reappeared, and shortly after we were served a gorgeous mince pie. Since this Christmas menu was all about historical dishes, the mince pies had a traditional, savoury filling of braised duck neck, Wagyu short ribs, plum sauce, hoisin, currants and oranges. At the same time a piece of the advent candle was cut off. The candle is made from white chocolate and has a passionfruit caramel and popping candy filling. Twelfth course: Christmas version of 'Like a Kid in a Sweet Shop'. A Christmas tree stump, decorated with edible golden baubles (with a citrus fromage blanc, apricot, semi-dried grapes and popping candy filling), edible Oban whisky jelly Christmas lights, apple pie and mince pie caramels (in the green box), edible 'branches' (with a chocolate and raspberry filling) and last but not least some Fat Duck classics like aerated chocolate with mandarin jelly (in the silver box), Queen of Hearts (white chocolate playing card with a raspberry compote filling) and Fat Duck coconut baccy (coconut infused with an aroma of Black Cavendish tobacco). So, that was the 12-course Christmas menu. There was one final surprise however, in this case literally the icing on the cake. 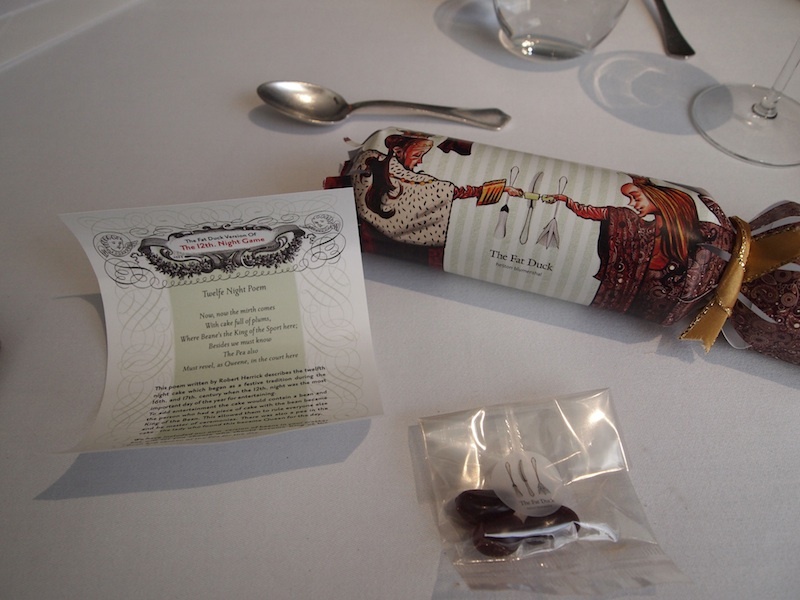 All guests got to take home a specially made Fat Duck 12th Night Panettone with pine-flavoured icing sugar, together with the Fat Duck 12th Night Game, which came with a set of 12 cards with illustrations by artist Dave McKean. Dave McKean has been working closely with the Fat Duck for many years and he also did the illustrations for the The Big Fat Duck Cookbook and Heston Blumenthal's latest book Historic Heston. 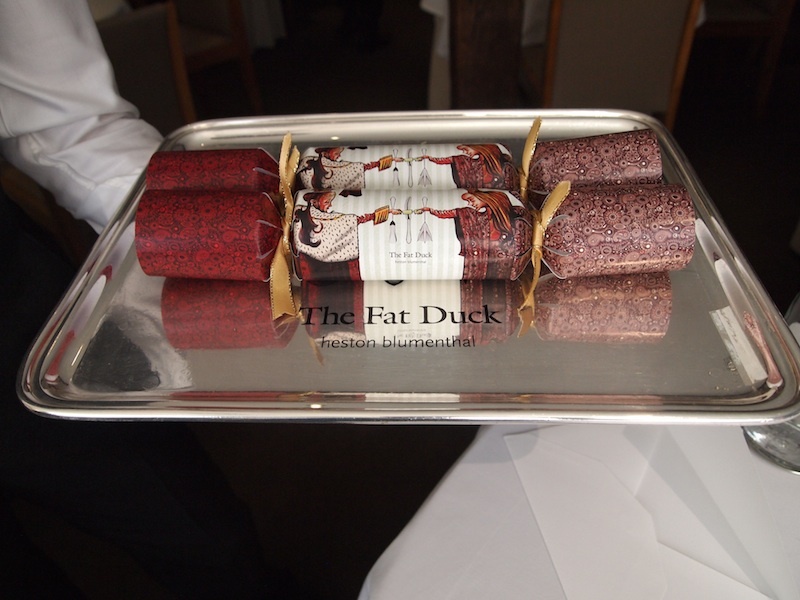 This was my second Christmas lunch at The Fat Duck and this is the third article I write on my website about The Fat Duck. In the previous two I have already expressed my admiration and fascination for this restaurant and I refer to those comments wholeheartedly. The commitment, pride and passion of the entire team, both in the kitchen and front of house, make for a restaurant where nothing is left to chance and perfection is the norm. Perfection can come across as cold or even soulless, but not so here. Every dish is a love affair and this is food to fall in love with. This Christmas menu was yet another tour de force of festive and very stylish dishes, of which more than half were brand new and created especially for this event. In keeping with the theme which had been chosen for this lunch, the dishes were modern versions of historical ones. The knowledge machine that is the Fat Duck, transformed the historic originals into dishes that display the art of reinvention, the reassembling of classic dishes with modern ingredients and techniques, all with full respect for tradition. Thus, this Christmas menu was very innovative and challenging but at the same time very attractive, harmonious and gratifying. From a technical perspective, the dishes are extremely intricate and far more complex than even the most experienced diner would realise and they all speak of and fit into the constant culinary evolution that takes place at The Fat Duck under the aegis of Heston Blumenthal and Jonny Lake. It is this never-ending quest for perfection that continues to keep this restaurant ahead of the curve. It is the "Yes, we can" mentality of everyone at The Fat Duck that separates the men from the boys - and the women from the girls.